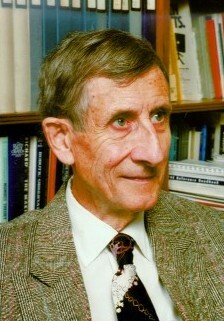 Mathematical physicist and author Freeman Dyson is professor emeritus of physics at the Institute for Advanced Study in Princeton, New Jersey. He was born in England and worked as a civilian scientist for the Royal Air Force during the second World War. He graduated from Cambridge University in 1945 with a BA degree in mathematics. He went on to Cornell University as a graduate student in 1947 and worked with Hans Bethe and Richard Feynman. His most useful contribution to science was the unification of the three versions of quantum electrodynamics invented by Feynman, Schwinger and Tomonaga. Cornell University made him a professor in 1951 without bothering about his lack of Ph.D. He subsequently worked on nuclear reactors, solid state physics, ferromagnetism, astrophysics, and biology, looking for problems where elegant mathematics could be usefully applied. He was a physics professor at the Institute for Advanced Study in Princeton from 1953 to 1994. Weapons of Hope (1984) is a study of ethical problems of war and peace. Infinite in All Directions (1988) is a philosophical meditation based on Dyson’s Gifford Lectures on Natural Theology given at the University of Aberdeen in Scotland. Origins of Life (1986, 2nd Edition 1999) is a study of one of the major unsolved problems of science. The Sun, the Genome and the Internet (1999) discusses the question of whether modern technology could be used to narrow the gap between rich and poor rather than widen it. Dyson is a fellow of the American Physical Society, a member of the U.S. National Academy of Sciences, and a fellow of the Royal Society of London. He has received 21 honorary degrees and a long list of awards for his outstanding academic achievement.